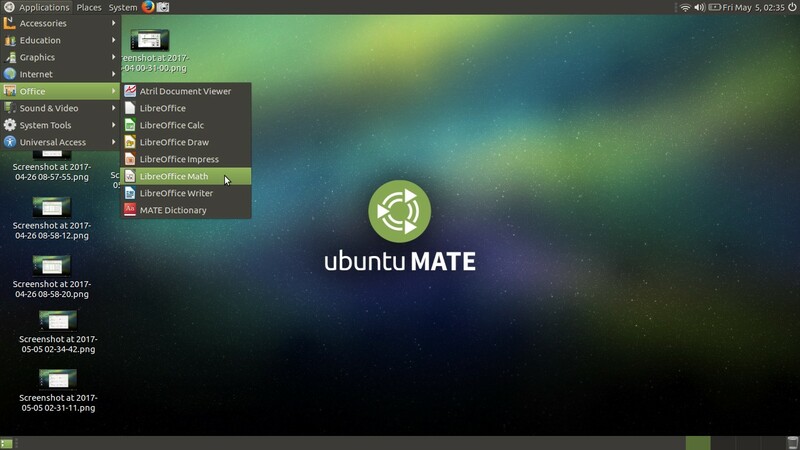 Ubuntu MATE 17.04 has been released at April 13th 2017. Here is a review for this user-friendly, desktop-oriented operating system with highly customizable interface and complete set of software. It keeps the same user-experience from the old Ubuntu GNOME2 era while also providing 4 other desktop layout choices (that resemble OS X, Windows, and Unity plus a Netbook-friendly look) and user can transform between them anytime. With only around 550MB of RAM idle use and the latest MATE 1.18, Ubuntu MATE 17.04 becomes an ultimate desktop choice for everyone. I hope you'll enjoy this review and be comfortable with 17.04. 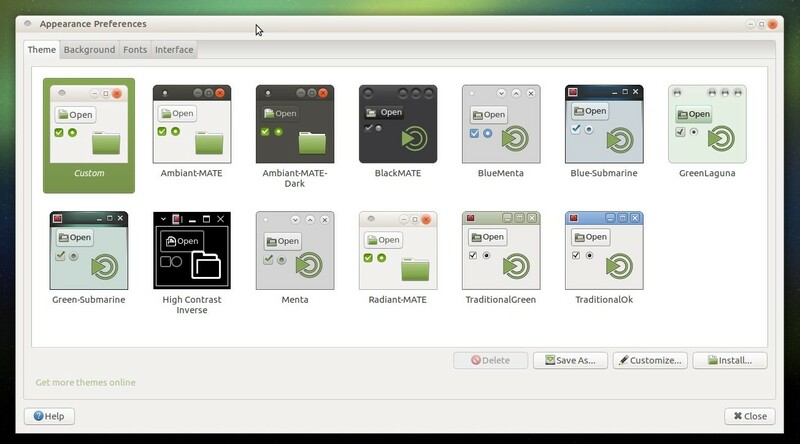 This is the user interface of Ubuntu MATE 17.04. It features double panel (top-bottom) with menu on top-left, system tray on top-right. The control buttons are located at top-right on every window (as opposite to Unity). 17.04 features 5 different desktop forms that is interchangeable easily. Menu is located on top and is in drop-down style. 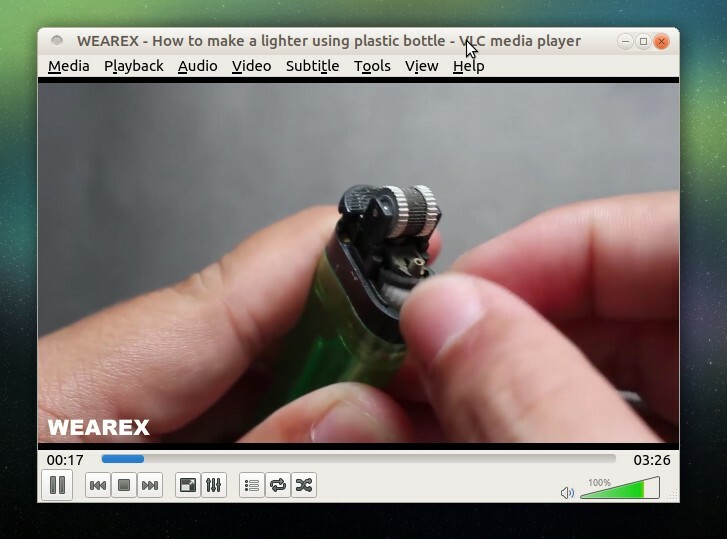 See the titlebar: the control buttons are on top-right. This resembles typical window on Microsoft Windows. 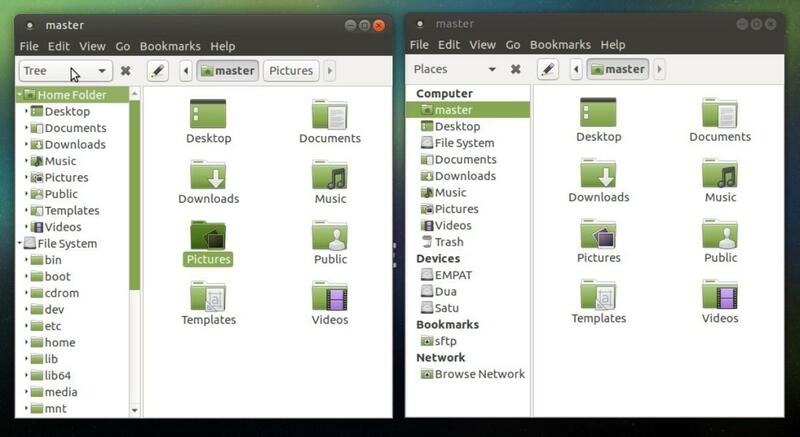 The desktop is usable on Ubuntu MATE to place shortcut icons. And also the panel is usable as well to place them. The tray is also on top. Special for network applet, the user opens it by right-click. These are the wallpapers of Ubuntu MATE 17.04. 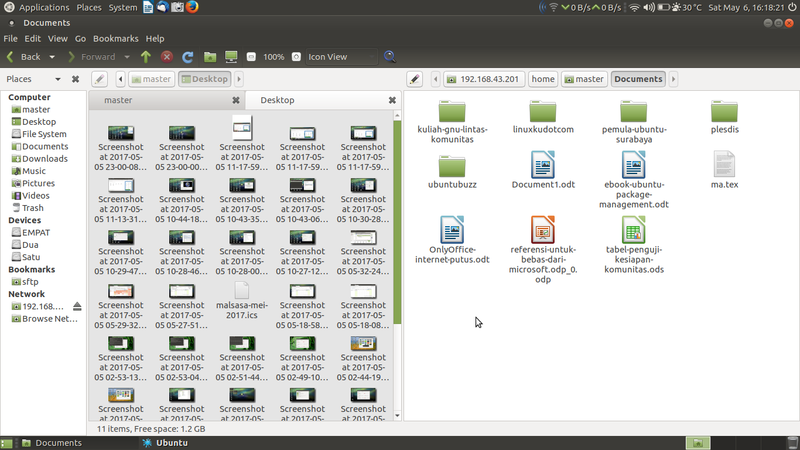 They are stored at /usr/share/backgrounds/ubuntu-mate-zesty directory. They are contributed by Ubuntu MATE Community and my favorite is Ubuntu MATE Sunset by Antechdesigns. 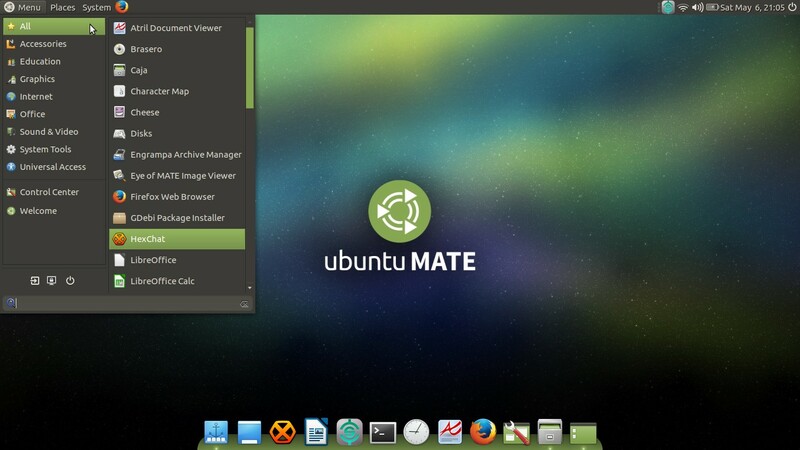 Ubuntu MATE 17.04 provides you 5 different desktop forms: Windows-like, MacOS-like, GNOME2-like, Unity-like, and Netbook-oriented looks. 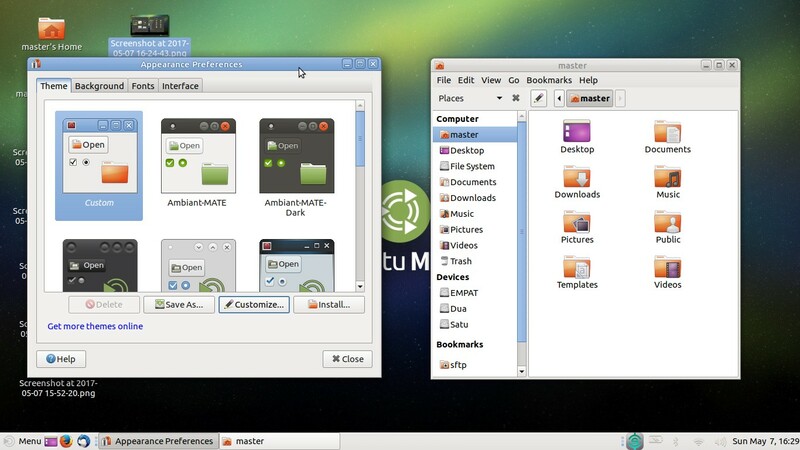 You can transform your desktop by changing Panel Layout on MATE Desktop. It's located at menu > System > Preferences > Look and Feel > MATE Tweak. A bottom panel, bottom-left corner menu, Super key to open menu, plus system tray on bottom-right corner. It has no top panel. 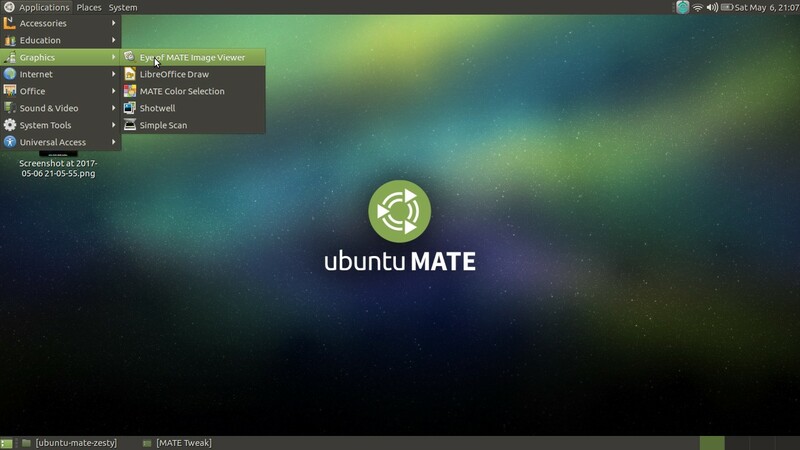 If you switch to Ubuntu MATE from Windows or KDE, this form suits you. For most users, I recommend this form for daily use. This is the default form. 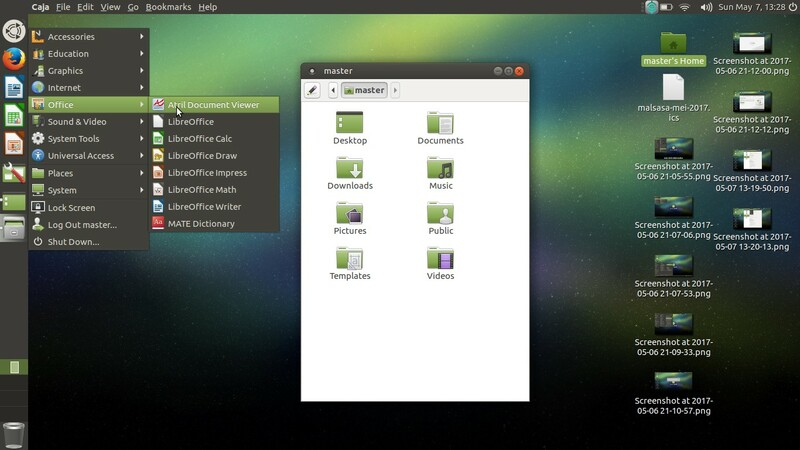 But MATE Tweak here provides Fedora Layout, Ubuntu MATE Layout, and GNOME2 Layout. 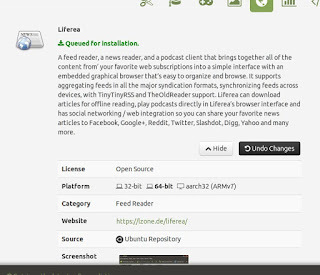 So if you are formerly Fedora or GNOME 2 user, you'll feel like home by these. 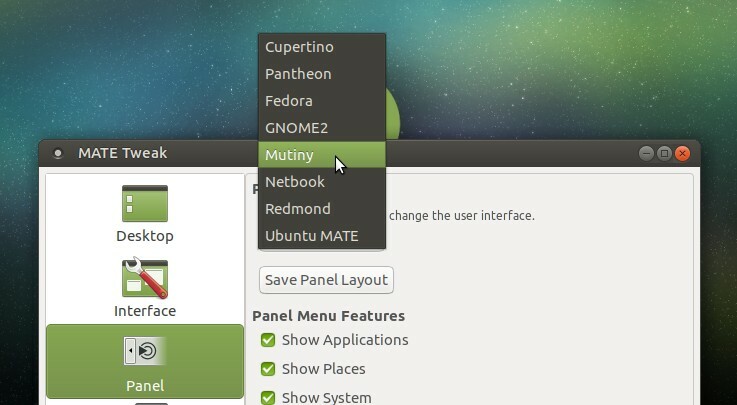 You can also have Unity-like desktop by changing panel layout to Mutiny. Even it has global menu (but in my system, it cannot show the submenu as crashing on every click). This is the reason why Plank is included. If you are formerly MacOS user, with top panel and bottom dock, you'll like this form. This is the screen-space-saving form. It has a single top panel as task bar, menu bar, and system tray. It has no bottom panel. It will suit you while using small laptops. And yes, if you're formerly XFCE user, you'll familiar with this. You can edit the layout as you wish and save it. That would be your own layout theme. You can, for example, adding top panel with autohide function and Plank. Save the result via MATE Tweak. There are dark and light themes available built-in. If you need bright colors you will like RadiantMATE (see screenshot). If you need dark theme, you will like AmbiantMATE Dark. And if you want the nostalgic one, use TraditionalOK. 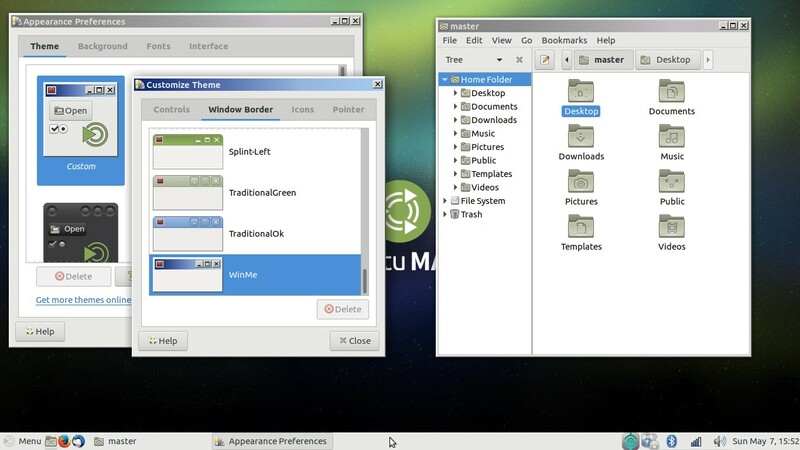 This is the replacement of classic Clearlooks theme from the beloved old Ubuntu era e.g. 8.04 Hardy Heron. Even if you need Windows 98 theme, it's preinstalled under the name WinME. 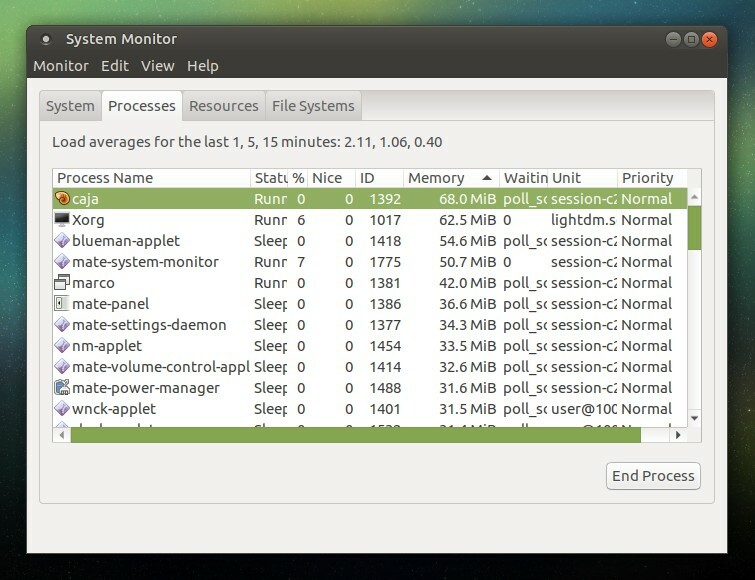 Ubuntu MATE 17.04 uses around 550MB of RAM at idle time after freshly installed. This is a lower cost comparing the same 17.04 releases: Ubuntu Budgie uses ±800MB and Ubuntu Unity uses ±1GB. But it's still higher than Xubuntu with ±330MB or even Kubuntu with ±400MB. 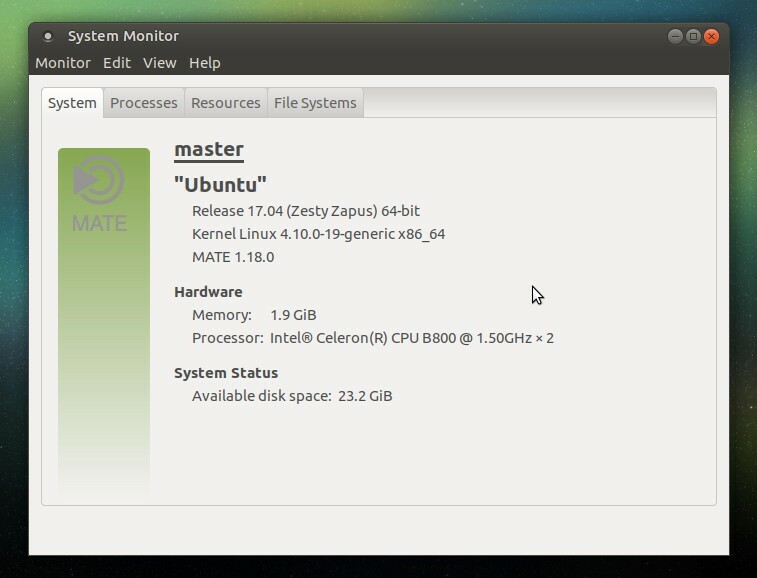 I can count Ubuntu MATE 17.04 as suitable for all computers especially the old ones with at least 1GB of RAM. It consumes around 550-590MB or RAM when idle. A very good number to beat Ubuntu Unity. What eats my RAM the most? 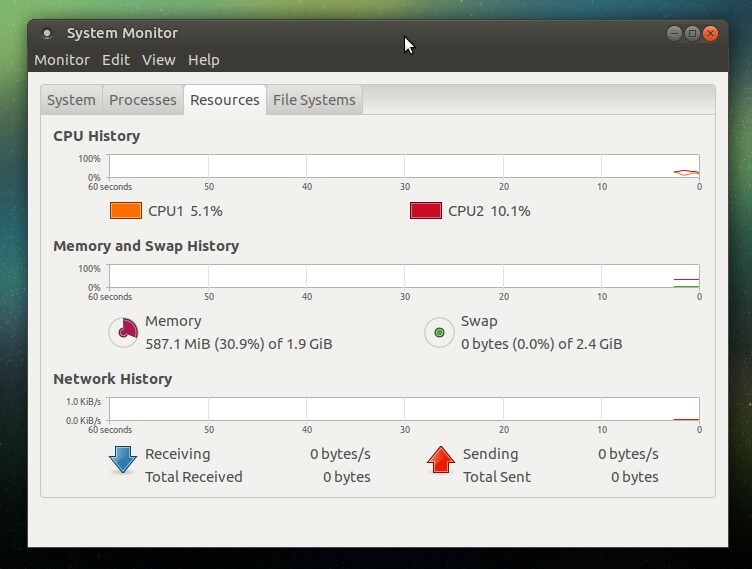 By showing all processes System Monitor shows caja (68MB), Xorg (62MB), and blueman-applet (54MB) as the top three. 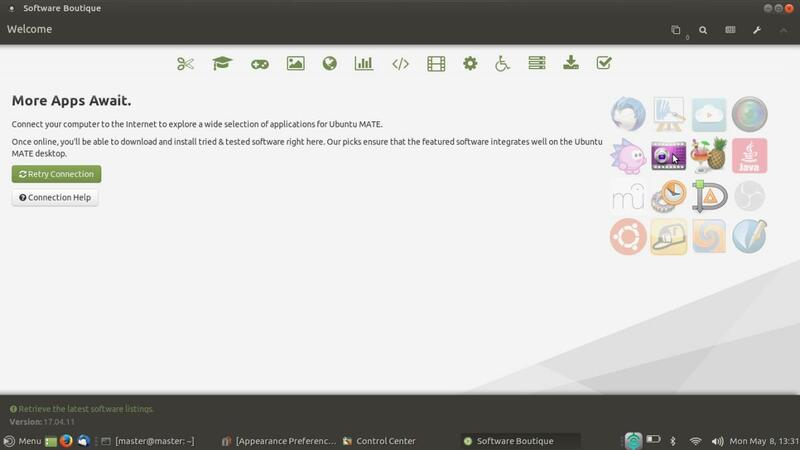 Ubuntu MATE 17.04 brings complete set of software for daily use. Here is a table to display some. Caja File Manager handles all files and folders for you. Caja has multitabbing (Ctrl+T) and vertical split (F3) features, along with file search, remote login (SFTP), open in terminal, and easy look-and-feel customization. It's how sidebar is displayed. Left: tree view, right: places view. 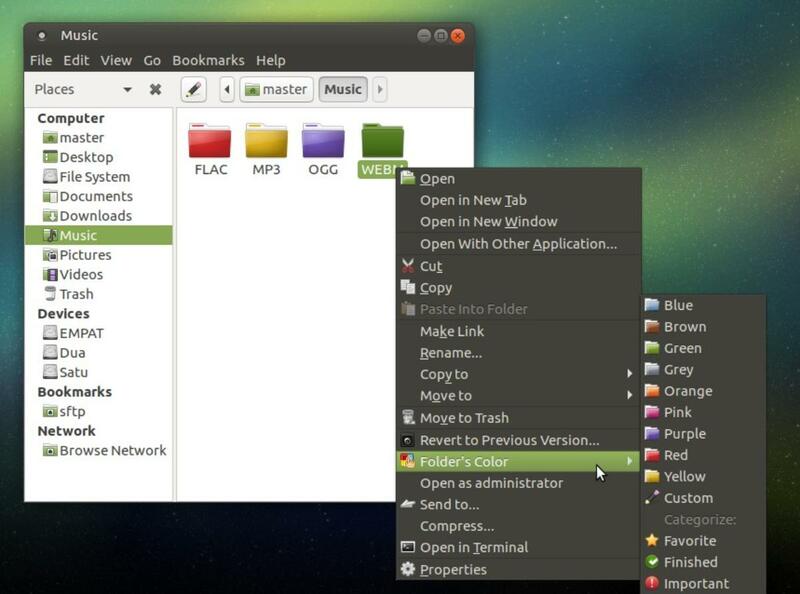 On Ubuntu MATE, user can change the folder color easily using right-click. This fancy feature is very fun. User can put some emblems to any folder. For example, put Video emblem to a folder containing videos. 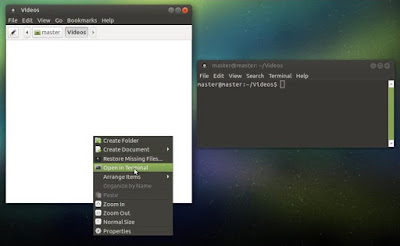 We know this feature was super popular on the old GNOME 2 and disappeared since GNOME 3. I'm glad that this good feature is still alive. Thanks to MATE Developers. 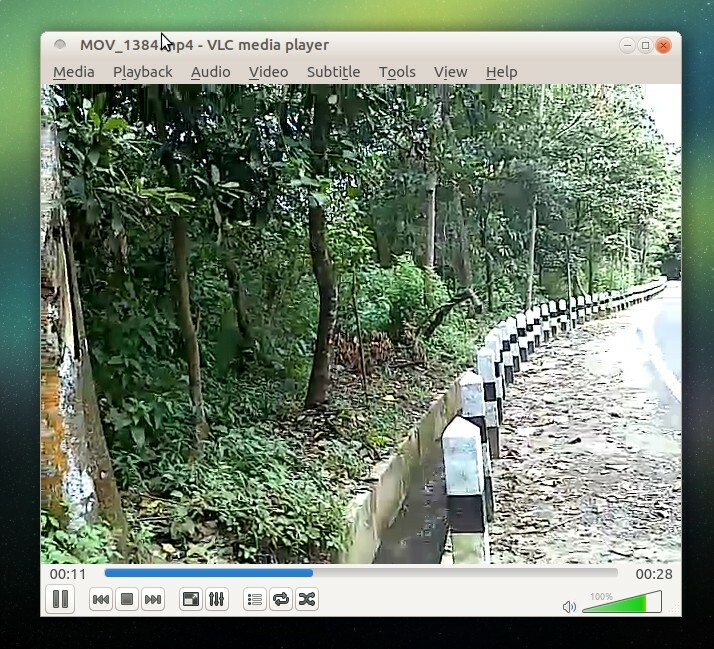 Ubuntu MATE can play MP4 video, MP3 audio, and also stream YouTube via built-in VLC Media Player. 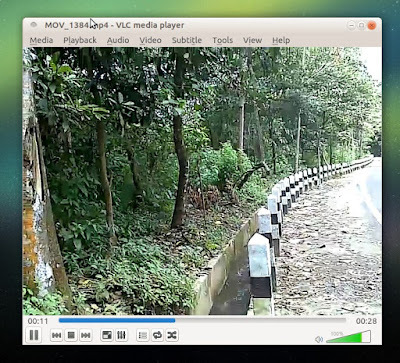 Ubuntu MATE can also play OGG/FLAC audio using Rhythmbox (MP3 support are not preinstalled but available on repo). To do so, press Ctrl+N > go to Network tab > paste URL to the text box > press Play. Here, Rhythmbox playing some OGG audio files. Program installation in Ubuntu MATE 17.04 is very easy with Software Boutique. This is the fresh and awesome software center that has clean interface and user-friendly. 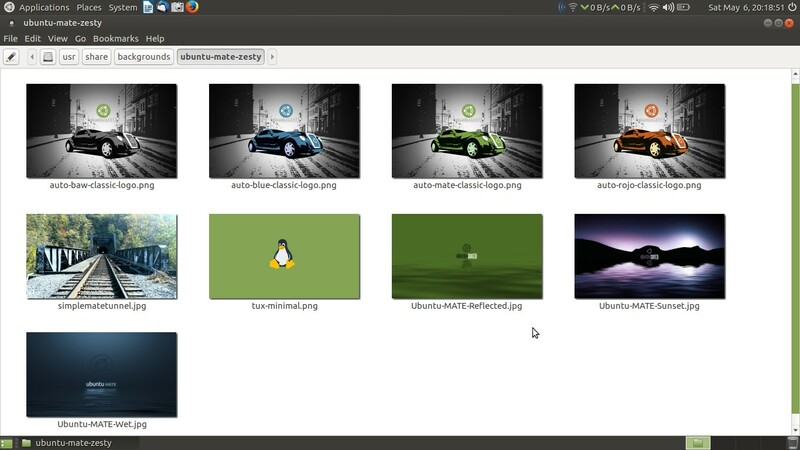 With this program user can find and install software from Ubuntu Official Repository. Important note: Boutique will offer you another software centers (Synaptic & GNOME Software) in case the number of software displayed here is limited. This is the interface of Boutique. It has icon-centric appearance with simple layout. It has a horizontal panel showing icons to represent categories. To mention some: Accessories, Education, Games, Graphics, until Universal Access. This is how software displayed on Boutique. It shows each software with a description and a few buttons, arranged in table with double column. Personally I like this way of displaying because it's easier to distinguish one from another. Clicking Details button reveals the details of software sucah as license, platform, and source (whether it's from official repo or PPA). It also shows screenshot. 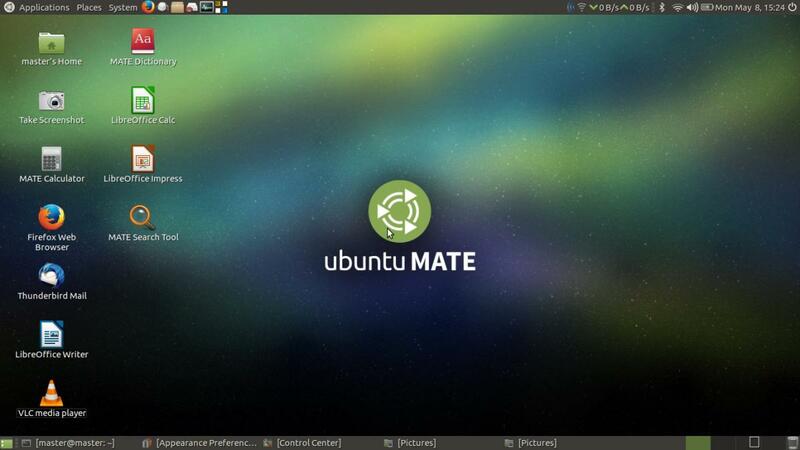 Note: you can run Software Boutique manually using a command $ ubuntu-mate-welcome --software-only . Ubuntu MATE 17.04 also features GDebi so we can install .deb package by right-click. 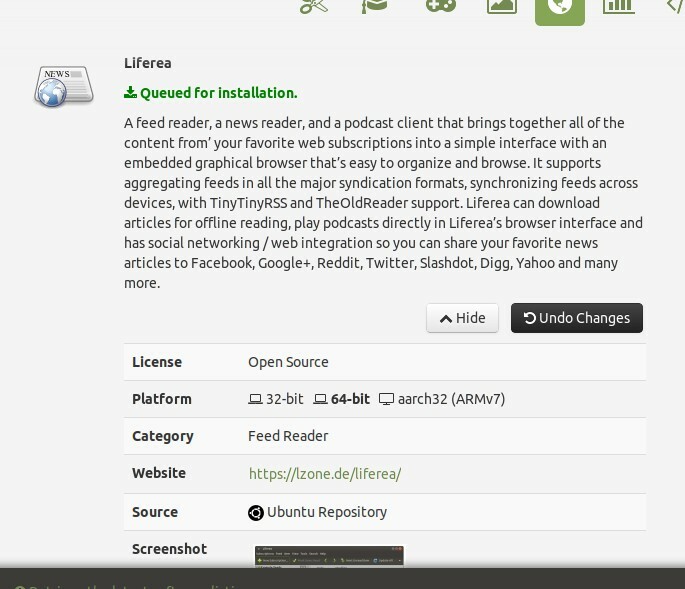 This section displays some example of Ubuntu MATE instant use on everyday life. This features calendar, desktop search, chatting, office documents, and customization. 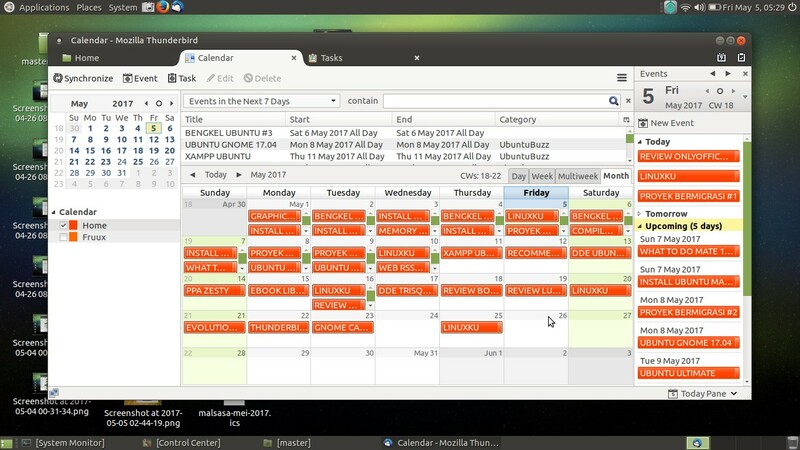 Ubuntu MATE uses Thunderbird as calendar & schedule manager program. It comes with Lightning addon. It can sync your online calendar (Fruux, Google) as well as managing your own offline calendar. 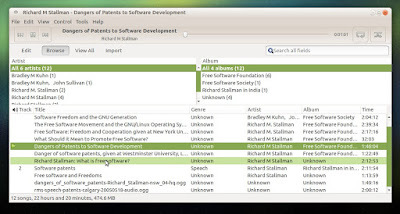 Ubuntu MATE provides ability to search file very fast and it can search through file content. This is an ability needed by programmers (e.g. to find some function on what files). Picture below demonstrates how to find files containing the word "latex". There is Hexchat preinstalled for IRC chatting. 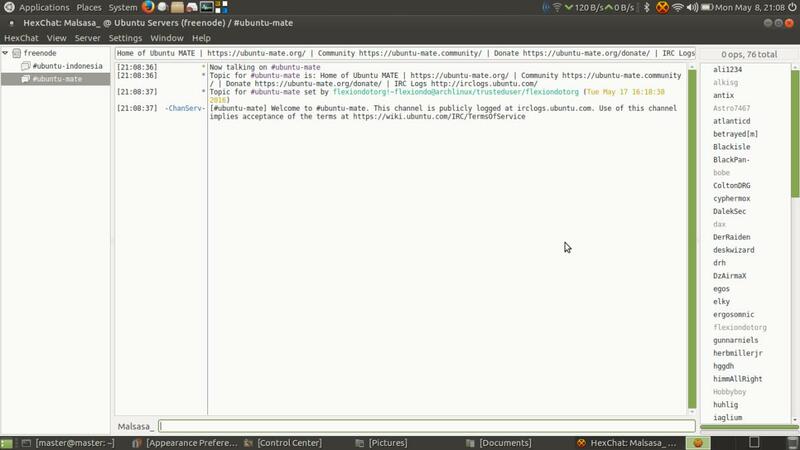 The main purpose for the users is so they can contact worldwide users and developers on official IRC channel of Ubuntu MATE: #ubuntu-mate @ freenode. If you have any problem, you can ask there. 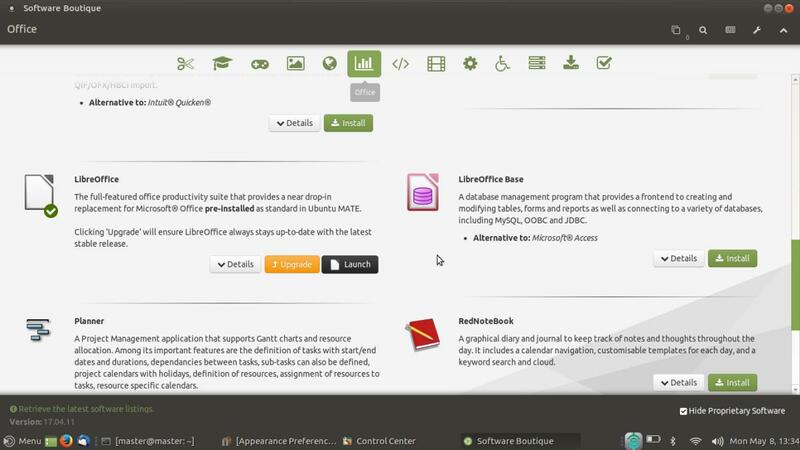 LibreOffice 5.3 is featured as main office suite. 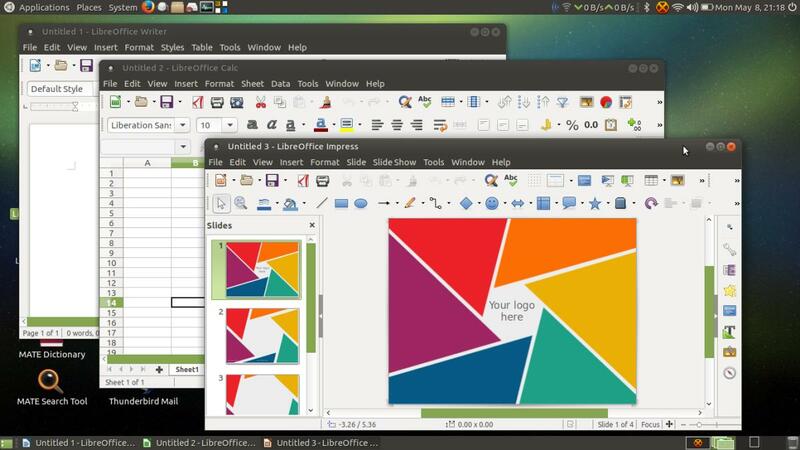 LibreOffice is a complete and free office suite that supports both document format from Microsoft Office (docx/xlsx/pptx) and ODF (odt/ods/odp). You can compare these to, for example, Ubuntu Unity where you can't change the panel or add one there. 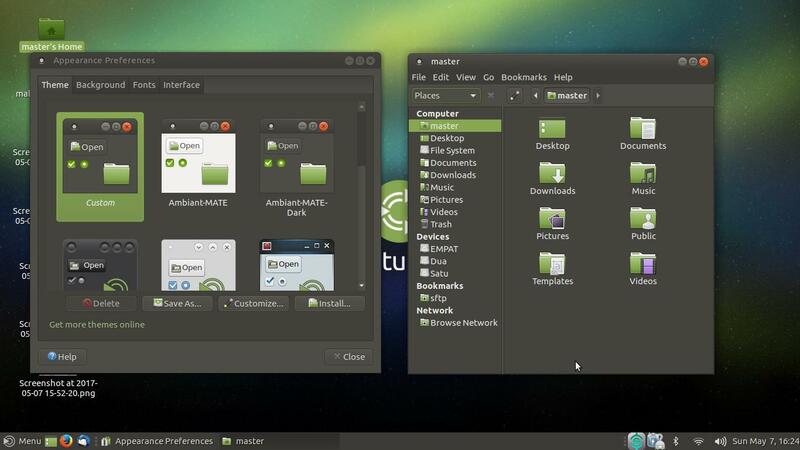 Desktop on Ubuntu MATE is more customizable. User can open terminal from any current directory by right-click. For formerly another distro users, this feature is important. And Ubuntu MATE provides you MATE Search Tool you can use to find some strings or functions inside any file. 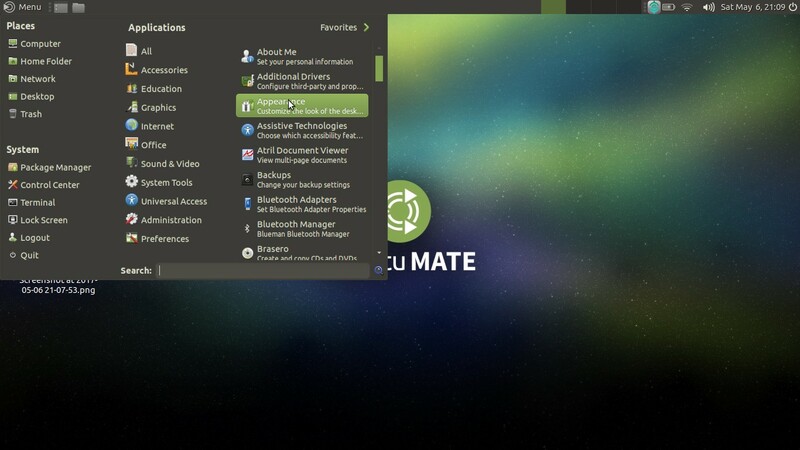 Ubuntu MATE 17.04 is a good choice for all desktop purposes with instant needs (multimedia and daily tasks). It takes only around 550MB of RAM at idle time is a incredibly positive surprise for GTK+3-based OS at 2017. It means everyone can use modern GNOME2 (with fully GTK+3) on any computer especially the old one (at least it should have 1GB of RAM) and have a good life. 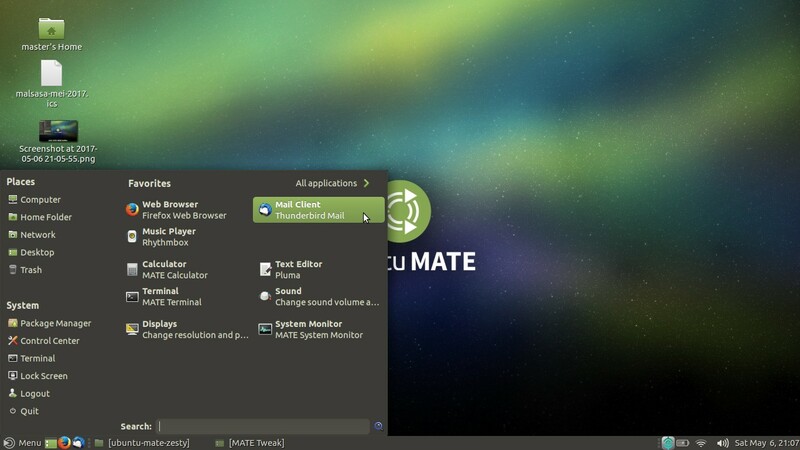 Its complete set of preinstalled software is a plus point so clearly we can recommend Ubuntu MATE for anyone especially those liking Ubuntu but cannot choose Unity/GNOME because of hardware requirements. 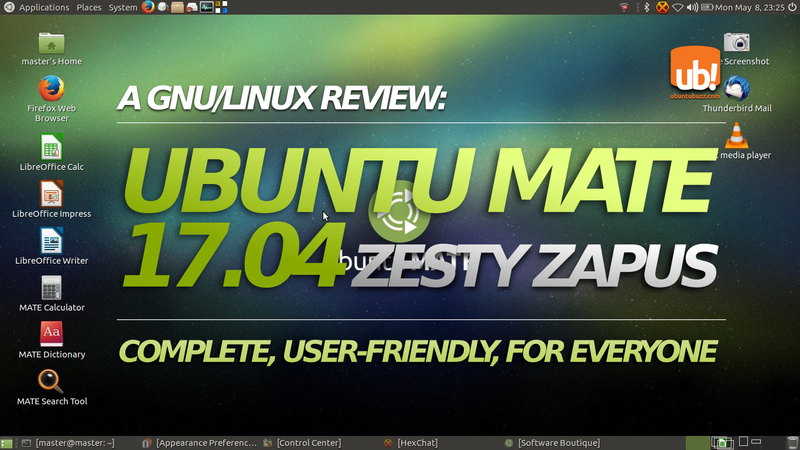 Thanks to Ubuntu MATE Team!